The Hofbräukeller beer garden, not to be mistaken with the Hofbräuhaus, is located at Wiener Platz in the central Munich Haidhausen district. The Wiener Platz is a lively market square with various stalls, shops and cafes set in an idyllic toytown atmosphere. Hofbräukeller beer garden has about 1,400 seats on traditional beer garden benches in the self-serviced area and about 400 seats in the serviced area. The self-serviced area is almost completely covered by a canopy of dense chestnut trees. The regular tables in the serviced area are partly located in the main section of the beer garden and partly under sun umbrellas on an elevated terrace. The food stalls of the self-serviced area offer a Bavarian meals, such as Obatzda, Wurstsalat (sausage salad with vinegar) and spareribs. The beer served is Hofbräu and one Maß Hell costs €8.40 (May 2018). On sunny weekends, music bands perform live in the beer garden. The lounge area "Sausalitos" with deck chairs at the main entrance serves cocktails in the evenings. Major football tournaments are shown on large screens in the beer garden. A much appreciated service of the beer garden is the child care section. Parents can enjoy their Maß and free time whilst their kids are watched by a nanny at the playground. A wireless internet connection is provided free of charge to all guests. The Hofbräukeller building exists since 1892. Various rooms in different sizes can be rented for special occasions and private parties. 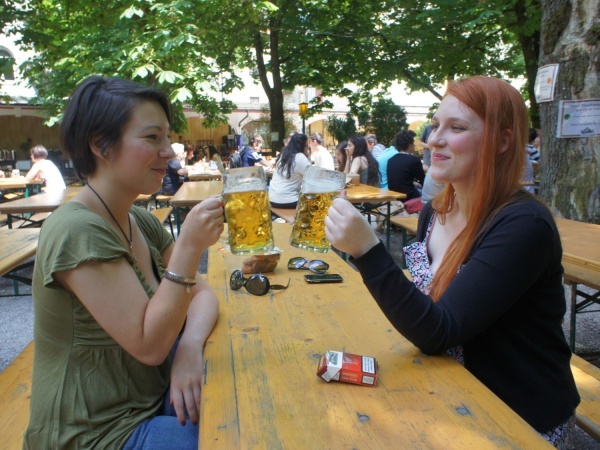 The beer garden is open daily from 10am to 11pm, sometimes even until midnight. The last beer is served at 10.30pm. This page was last modified on 18 May 2018, at 18:40.